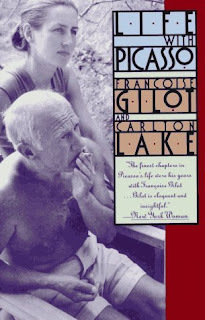 Life with Picasso by Francoise Gilot and Carlton Lake provides stunning insights – both fascinating and horrifying – into the life of one of the greatest modern artists. According to Gilot’s narrative, Picasso truly is L’Enfant Terrible, a teenager in an aging man’s body. He devoted his life entirely to his art, and expected everyone around him to demonstrate that same obsession. Unlike other artists, Picasso was extremely successful within his lifetime, giving him even more reason to be a complete diva. Gilot meets Picasso in Paris. She is a young artist while Picasso is well into his 60s, and they fall into a strange kind of love. The young girl/older man thing didn’t bother me because Gilot is clearly intelligent and in control of herself. Picasso is controlling and obsessive, but unlike his past mistresses, Gilot is not passive. She enters into the relationship knowing to expect nothing from him. She’s in love with his genius and his art, and sees her roll in Picasso’s life as a contribution to his work. Until now, I never really liked Picasso’s art. I enjoy his classic drawings, but other than that I just didn’t get it. But this book explains (sometimes in too much detail) his artistic process. Gilot writes about Picasso’s theories and processes in his paintings, and as an artist herself, she can speak with authority on the subject. Picasso is obsessed with the “rhythm” of his paintings and the use of space. 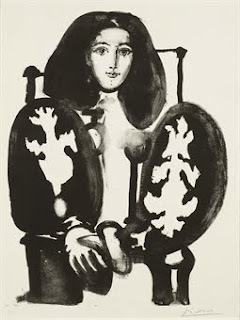 While working on a series of lithographs Portrait with the Polish Coat (Le Manteau Polaise), he explained, “The form itself is only a hollow area with sufficient pressure applied to it by the space surrounding it to make the apple seem to appear, even though in reality it doesn’t exist. It’s the rhythmic thrust of space on the form that counts” (219). 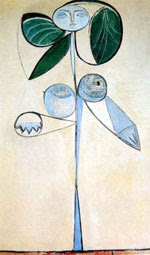 We learn how La Femme Fleur, a portrait of Gilot, started as a fairly realistic picture but evolved. “Even though you have a fairly long oval face what I need, in order to show its light and its expression, is to make it a wide oval. I’ll compensate for the length by making it a cold color – blue. It will be like a little blue moon” (117). “The Woman Eating Sea Urchins [la femme aux oursins] was begun one afternoon in a realistic manner. Everything about the portrait was a recognizable representation of the woman as we knew her: pug nose, corckscre curls, man’s cap, and the dirty apron in which she enveloped herself. Then, when it was finished, each day Pable eliminated a few more naturalistic details until there remained only a very simplified form, almost vertical, with just the plate of sea urchins in the middle to remind one of what she looked like” (135). Life with Picasso is not a plot-driven page-turner, but it is a great book. 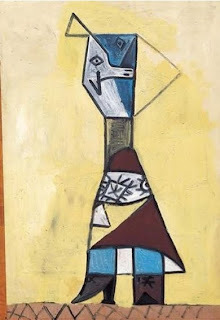 I love Francois Gilot – her strength to spend 10 years with Picasso, and then eventually leave him is impressive, and her writing about it is poignant. “There was no longer a real dialogue; each of us carried on a monologue in the direction of the other” (346). Sorry for all the quotes in this post, I just wanted to give you an idea of the writing style and what you’ll get out of reading this book (which you should do!). Read more of my Art Book Posts here.